Every day of the week people sit over coffee and get genuinely excited about the prospect of this amazing new business idea they have just harvested in their mind. Starting up a business is bloody tough and it is the allure of doing really excellent work and contributing in some way to your industry, that continues to draw people in every day of the week. Well that and the possibility of making a lot of money in the process. Of the 20,997 new companies registered in Ireland in 2016 I’d say it is safe to say, none set out on a crusade for being ordinary. Starting a business involves investing a lot of your own blood, sweat, tears and hard cash. Now that we have established nobody sets out on day one to run a distinctly average business, or team, how do so many end up falling right into the middle of this bucket. Exceptional is becoming a rare commodity in the world of business despite all of the education, technology and resources people have at their disposal. 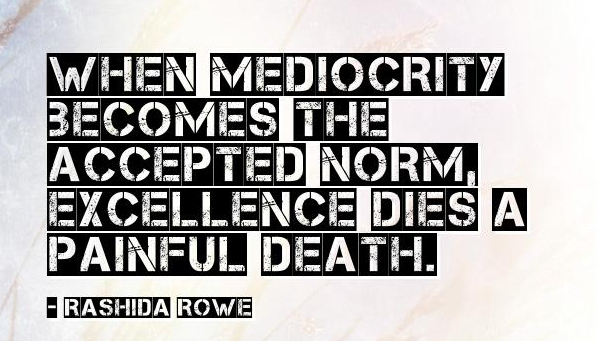 So what is behind this onslaught of mediocrity? Some never get beyond being average but worse still, some grow fantastic businesses, only to let them slide away back into the dime a dozen dog fight. Below are some of the things I am witnessing in my work with business owners and teams as well as my every day experiences as a consumer on the street. There will obviously be variances according to industry, but some hold true across the board. The skill set that gets people to leadership positions are not necessarily the ones that will help them lead. As a result they spend too much time on the floor micro managing and doing the tasks they are good at, but not the ones they should be doing now. They should be focusing on the bigger picture of the future direction for the business strategically and not getting involved in every trivial decision. The same applies in reverse however as some sit in the ivory tower all day and have no feel for their business, or customer needs. They make a few quid fast and then spend most time out of the business living the Instagram life. It is a fine balance that needs to be struck, but lean more towards the macro every time. If you adapt a coaching philosophy it will empower your staff more and give you more time to focus on what your actual role is. A very useful exercise I get managers to do is take a sheet of paper and divide it into 2 columns. On one side write down how they spend their week and on the other write how they should be spending their week based on their actual role. If there is a massive variance between the two, you need to put the skids on and take some corrective action. I see this a lot and have sat across the table from several high achievers in this country and could see the implosion coming. If you don’t look after your body and mind you will crash. Hard. Now I’m not naive and realise that getting a business, or team, to a level of excellence requires a lot of time and hard work. In the short term the balance needs to be tipped off centre whilst doing so. This is not sustainable and if you want to have a successful business, or be alive, in the long run you need to address this. Exercise, sleep and good nutrition are vital aspects here. Not just for your overall well being, but for your ability to make clear and articulate decisions, communicate positively and work those long hours. Don’t wait until the doctor delivers some alarming news, or you are writhing on the floor holding your heart, as it may well be too late. It needs to become a priority very high up your list or you will pass over it too easily every week. I always find time for exercise and if you are creative you don’t need a gym, swimming pool, or bike. This line tells me more about a company’s culture than any glossy mission statement in reception ever will. If you are not willing to make change then you are a dead man walking. Technology is changing how most business’s operate at an astounding rate. If you are happy with just doing things how you’ve always done, you will be left behind. Selling change to your employees can be a challenge as they can feel threatened and overwhelmed by new systems and processes. Training and coaching during this period can be crucial to getting everyone on board with the new direction you have set your sails in. Different people will come on board with change at different times, so you will have to be patient and supportive during the transition. The dreams of Dom Perignon and Maseratti’s can fade quite fast once the realities of the hard work required to build a business sink in. If your only motivator was money, then the temptation will come to pursue the next shiny thing that promises riches and notoriety. Patience is still a virtue, but for the younger generation it is not one they exercise too often. Once you begin to lose your love for the work, standards will inevitably start to slip and corners will be cut. The ol, “it’ll be grand sure” mentally takes over and before you know it a shark is being jumped on your watch. I personally believe that it’s not possible to remain at the very top of your game for a long period of time, if you do not genuinely love what you do. Yes you will still have bad days, but your Why remains solid. Jim Collins has provided us with the gold standard in literature of how to get from Good to Great, but sadly many are going in the opposite direction. Noticing the slide is the starting point, but many don’t seem to see things slowly unravel in front of their eyes. Seek objective feedback on your business regularly and then take corrective actions where necessary. If you’re in the ring throwing punches, you might as well give yourself the best chance of landing them.